Absolutely a winner and a gardener’s joy and delight! It was love at first sight when we saw the King’s Mantle for the first time at a nearby garden nursery, slightly more than a year ago. 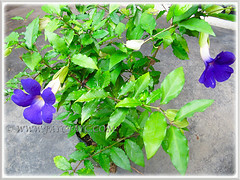 Its vibrant purple bell-shaped blooms with a contrasting yellow throat fascinated us so. Definitely too attractive and tempting to resist! Moreover, a potted plant just cost RM5.00. Dirt cheap and we grabbed one immediately. Currently, it is flourishing very well in a large pot, though sadly without much flowers. Hence, it has given us the impetus to research further about its maintenance, hopefully to induce flower production. 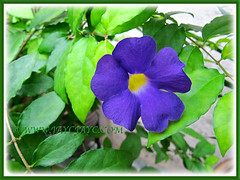 Common Name: King’s Mantle, Bush Clock Vine, Trumpet Thunbergia. Etymology: The genus name, Thunbergia is given in honour of Carl Peter Thunberg, an 18th century Swedish naturalist who was named ‘the father of South African botany’ and ‘Japanese Linnaeus’. The species epithet erecta is a Latin word meaning upright or erect, referring to its shrub. Origin: Native to Tropical Africa but naturalised and cultivated elsewhere. Plant type: A herbaceous perennial or annual, depending on the climatic regions. Features: Thunbergia erecta is an eye-catchy species of the genus, Thunbergia that consists of about 90 to 100 species of flowering plants, vining shrubs or climbers. It is a vigorous and fast-growing woody and sprawling shrub that can reach 2 m tall and as wide. Can be allowed to scale to 2.5 m in height. King’s Mantle is an evergreen perennial in the tropics and a deciduous annual in very cold regions. 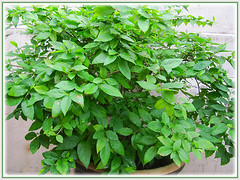 A bushy shrub with dense foliage, it produces small, ovate, medium to dark green leaves, simple with entire margins, and are arranged on opposite sides of stem. Stems are brown and thin and the multi-trunk will thicken as the shrub is regularly pruned as it ages. Five-petaled, trumpet-shaped brilliant purple flowers with yellow throats will emerge to adorn the lovely bush. The beautiful flowers are solitary (sometimes in small clusters) and axillary. Typically, there are two bracts closely subtending each flower. The most common flowers are vivid purple that become lighter to purplish-blue in semi-shade. Other rare varieties are ‘Alba’ with white flowers, ‘Lavender Ice’ with variegated flowers in lavender and white, ‘Blue Moon’ with voilet-blue blossoms and one with magenta-coloured flowers. Eventually dehiscent fruits are formed and when ripened will release its seeds and scatter to self-propagate new plants. 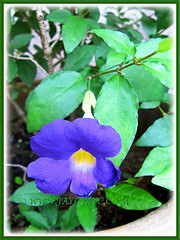 Culture (Care): Thunbergia erecta grows easily with minimum maintenance. Moisture: Water moderately and generously, especially during hot seasons. Moderately drought tolerant. Soil: Grow in moist, well-drained and humus-enriched soils. Adaptable to any garden soil as well. Others: King’s Mantle tolerates regular pruning well and this induces growth and flowering. You can shape it into a lovely bushy specimen in your garden. Feed once fortnightly with a balanced organic fertiliser, one that provides healthy growth and flower production with nutrient content of phosphorous and potassium much higher than nitrogen. Generally free from serious garden pests. For subtropical and temperate regions: Hardiness: USDA Zone 9b-11. King’s Mantle will become deciduous and undergo a dormant period in frost regions below -7.78°C (18°F). Do mulch to keep it warm when temperatures start to drop during cold winters. However it will quickly recover when weather warms up in spring. Flowering will commence from early spring to late autumn. Propagation: By seed or cuttings, the latter being the easier method. This plant can even self-seed and self-propagate. 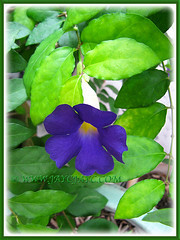 Usage: Thunbergia erecta or Bush Clock Vine will be excellent as a backdrop for low-growing plants in a mixed border. Ideal to add a splash of vibrant colour to your garden. Can be grown in large pots or containers. A beautiful ornamental shrub that will be great as a showy garden specimen or informal hedge and screen. 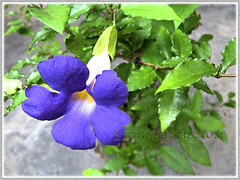 Google search images of Thunbergia erecta to be mesmerised with its many marvellous colours! How do. I propagate thunbergia from cuttings? I tried with no success. Take softwood cuttings from new non-flowering shoots and they’ll root readily with bottom heat. Hope this helps. what is the best season to grow it from cutting, and I am from Nepal.